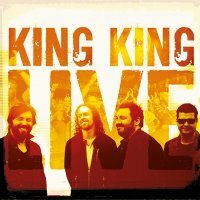 It's a shame their upcoming tour has had to be rescheduled due to Alan Nimmo's vocal issues because King King is on the verge of something big. Offering a nice, commercial version of the Blues with lots of openings for fans to find their space in, last album 'Reaching For The Light' was a sleek ride to their fantasies and yet, when seen live with Dan Patlansky recently, they had an engaging modesty which is creditable. That night they seemed enjoyable and casual but did not kill, perhaps too nice for that, but on this two-disc package, recorded as a hometown return to Glasgow with an absent DVD, that easy charm really engages. King King positively simmer through these twelve tracks, allowing time for their sound to cover you, letting the ease and enjoyment come through naturally. You'll get the big songs here, 'Long History Of Love' and 'Waking Up' for instance, slinky and Hammond-heavy, whilst 'All Your Life' is undeniably cool and Funky and the general feel is simple and very accessible.